The Garfield Historic District traces its origins to early agricultural development in the Salt River Valley during the last quarter of the 19th century. In 1870, a handful of farmers were establishing irrigated fields near present Phoenix. In 1870, they formed the "Salt River Valley Association" to determine the best place, among several contenders, to found a townsite. Members selected the north half section of Section 8, Township 1 North, Range 3 East and employed Captain William A. Hancock to survey and lay out the city of Phoenix. Although the area population was estimated at only 235 residents in 1870, the settlers predicted that Phoenix would become a metropolis and planned their city accordingly. The city stretched one mile east to west and a half a mile north to south (See Continuation Sheet pg. 65; Official Plat of the Original Townsite of Phoenix). The townsite was divided into 98 blocks. Most blocks were 300 feet long and contained twelve lots measuring 50' by approximately 135' a-piece. Even Block 22, which was set aside for a Public School, was divided into twelve lots. (ii) The overwhelming majority of lots fronted onto the long east-west streets. Exceptions were blocks that formed the eastern and western boundaries of the town; they contained only 10 lots apiece. Two blocks remained undivided; Block 23 and Block 76 were entirely dedicated for a city hall and courthouse square, respectively. Lots around the two public squares were narrow, 25-foot parcels configured to front onto the courthouse and city hall. With direct access to the city hall and courthouse, these lots commanded higher prices at auction for their commercial value. Streets were laid out in a strict gridiron pattern. East-west running streets were named for presidents; Washington and Jefferson streets were slated as the principal downtown thoroughfares. Center (now Central Avenue) Street was the main north-south running street. Center Street divided the townsite into two equal halves, with seven north-south streets to the east and seven north-south avenues to the west. Most streets were eighty feet wide, with the exception of Washington and Jefferson Streets, and Central Avenue, which were 100 feet wide and intended to be the principal thoroughfares of the city. Most lots fronting onto east-west running streets, although some blocks fronting on the courthouse and city hall faced north-south. The plan was practical and democratic. As platted, the city was rectangular in shape, twice as wide, east to west, as it was long, north to south. Its unwavering grid-like streets contained equal-sized blocks with equal-sized lots. The pattern was relieved only by the commercial and civic blocks at the core of the plat, and even they were laid out and subdivided in a symmetrical fashion. The farmers who selected the Phoenix townsite had more than a passing interest in choosing its location. Access to markets and shipping facilities, as well as the potential for development opportunities in the new city, may have driven the proceedings. Among the founding members of the Salt River Valley Association formed to identify the townsite was John T. Dennis, a farmer who had moved to the valley in 1868, shortly after modern irrigation was initiated. Upon his arrival, Dennis established a large farm just beyond the northeast corner of the future Phoenix townsite. It ranged from present 7th Street on the west, to 12h Street on the east, and from Van Buren on the south, to Roosevelt on the north. As a member of the Salt River Valley Association, Dennis helped choose the location for the Phoenix townsite in 1870. The sites proximity to his farm may have played a role in his deliberations. Over the next fifteen years, Dennis farmed his tract and pursued several business ventures in Phoenix. With his partner, James Murphy, he established a mercantile business on Washington Street, between First and Second streets. The firm of Murphy & Dennis brought the first threshing machines to the Phoenix area (Farish 1918: 137). Phoenix grew slowly at first but higher agricultural prices in the 1870's, immigration through the Desert Land Act of 1877, and the arrival of the Southern Pacific Railroad in 1879, enhanced the region's prospects and helped spur the city's population. By 1881, Phoenix incorporated and land owners on the city's edge were eager to subdivide their farmland for more lucrative residential development. Dennis was one of the first to take advantage of the opportunity.iii and his farm lay just beyond the Phoenix townsite boundaries. In 1883, he carved the farm into nine large blocks of varying sizes and filed a plat for the Dennis Addition to the city of Phoenix (Dennis Addition, November 16, 1883, Maricopa County) (See Continuation Sheet pg. 66, Dennis Addition and Subdivisions). Major north-south streets in the addition were Arizona Avenue (9th Street), California Avenue (11th Street), and Carr Avenue (12th Street). All of these streets led directly to Van Buren Street, the southern boundary of the Dennis Addition. Like 7th Street, Van Buren was a major city thoroughfare. It formed the northernmost boundary of the Phoenix townsite. The streets divided the farm into nine large blocks of unequal size. Blocks 1-3, at the southern edge of the addition, were smaller than blocks 4-9. Block 1, at the southwest corner of the tract, measured about 1020 feet from east to west by 815 feet from north to south. It was one of the first to be platted into individual building lots and Dennis may have subdivided it himself. (v) The 1899 annexation plat showed that the tract consisted of 51 building lots with 17 lots fronting onto Van Buren, and the remainder on either side of Dennis Street, between 7th and 9th streets. Block 2 was the same size as Block 1 but it was divided into ten lots that measured about 200' by 400'. Block 3, at the eastern edge of the plat, was somewhat smaller with only eight 200' by 400' lots. The northern three-quarters of the Dennis Addition was divided into six large blocks that would eventually be broken into numerous smaller ones bisected by new streets throughout the district. According to Dennis's original plat, four blocks between 7th and 11th Streets were the same size, measuring about 1,360' by 525'. The easternmost blocks between 11th and 12th Streets were somewhat narrower. The blocks were further divided into tracts for later resubdivision. With the basic form in place, Dennis began to sell parcels to investors who typically resubdivided them into building lots for sale to individual buyers. Between 1883, when he filed the Dennis Addition, and 1900, Dennis saw seven new subdivisions emerge from his former farm. Among them were the Mount Pleasant Tract (1892), the Sunny Side Tract (1894), Highland Addition (1894), and Hooper's Subdivision (1900). Dennis retained most of the land in blocks 6 and 7, at the western edge of the addition, for future development. Their proximity to the growing city of Phoenix likely increased their value as investment property. Of his remaining property, only Block 1 and lots 5 and 6 of Block 6 were carved into individual building lots by the turn of the 20th century. Although most of the lots in the Dennis Addition and its subdivisions were intended for housing starts, the western part of Block 2 held the Phoenix Water Company's pumping station. The station occupied a large lot at the southeast corner of Dennis (Polk Street) and 9th Street (Sanborn Fire Insurance Co., 1893). The private Phoenix Water Works Company had drilled several wells in the block as early as April 1889. The company's eight-mile pipe system supplied the city with about two million gallons of water a day. As depicted in the 1893 Sanborn map, the property contained a pump house building with an open porch around three sides, an attached repair shop, a well, an open-sided auxiliary building, and a pond. The private company satisfied the city's needs until a severe drought between 1899 and 1904 prompted voters to pass a bond election for a new municipal water system (Phoenix Water Services). In addition, the Salt River Valley Canal stretched across the southern portion of the district. Despite Dennis's efforts, buyers did not immediately flock to his subdivision. However, a few noteworthy individuals ventured out to "the country" where they built substantial homes in the 1890s. Among them were B. A. Hadsell, who built the Hadsell House (NR 1995) at 1001 E. Fillmore Street in 1893. Hadsell was one of the founders of the city of Glendale. Hadsell was followed by B. F. McFall, president of the Board of Education, and C. F. McFall, an assistant U.S. attorney, who occupied the house in 1918. George E. Cisney built the house at 916 (aka 910) E. McKinley Street (NR 1995) in 1897. Later, J. W. Spear, editor of the Arizona Republican, lived in the house. Other 19th century houses in the district include the 1898 E. W. Skinner House (NR 1995) at 917 E. Roosevelt Street, and the Phoenix Building and Loan House (NR 1995) built in 1898 at 1138-1140 E. Taylor Street. Still, no sustained development occurred in the area. As late as 1893, the Sanborn fire insurance company declined to map the area in detail, a sign that construction in the district was sparse. The maps did, however, show major streets in the addition, indicating that increased development was imminent. Furthermore, the maps showed a public school at the southeast corner of Washington and 9th Streets. Its presence at the edge of the district was further evidence that the neighborhood was poised for significant residential construction in the 1890s (Sanborn Fire Insurance Co., 1893). Lack of transportation may have deterred potential buyers from building in the Dennis Addition and its junior subdivisions initially. One of the great impediments to suburban development in the 19th century was the distance between home and work. Nationwide, as cities expanded beyond their town limits, developers planned and promoted suburban additions with the aid of streetcar lines. In an age before automobiles, the technique became extremely popular with developers and cities alike, leading to the proliferation of "streetcar suburbs" throughout the country. By 1888, a small, horse-powered streetcar line serviced downtown Phoenix, enabling residents to live some distance from work and business. In the following five years, the streetcar line was greatly expanded and electrified by 1893, rails stretched northwest to the fairgrounds and eastward to 16 ½ Street (now known as 16th Place). As the street railway system began to grow in Phoenix, John T. Dennis came to understand that access to streetcar transportation could improve land sales in his former farm; developers used streetcars to bring prospective buyers to their tracts and to guarantee their future transportation from the suburbs to the city center. Dennis collaborated with adjacent property owner Frederick Brill, who owned the quarter-section of land north of the Dennis Addition, to bring the streetcar line to their land. In 1895, Brill platted his land as Brill's Addition. That same year, Dennis and Brill invested in an extension of the Phoenix Street Railway to access both of their subdivisions. The extension was known as the Brill Line and it traveled east along Pierce Street into the Dennis Addition, where it turned north at 10th Street (formerly Alta) (See Continuation Sheet pg. 67, The Brill Line 1895). The line then passed through both the Dennis and Brill additions and terminated at McDowell Road at the northern end of Brill's land. Major stops in the Garfield Historic District in 1895 were at Pierce and 7th Street (then Cave Creek Road), at the western edge of the Dennis Addition, and at 10th and Roosevelt (then Baltimore), the northern boundary of the Dennis Addition and the southern extent of Brill's Addition. The investment proved fruitful, and houses began to appear on and near the streetcar line during the following decade. By 1899, with the aid of the streetcar extension, the neighborhood had grown sufficiently that the city of Phoenix annexed all of the original Dennis Addition, including its subdivisions. By 1899, the junior subdivisions had been carved into smaller blocks with new streets, including Prospect (Taylor), Hermosa (Fillmore), State (McKinley), and Highland (Garfield). For many years, these streets were limited to the interior of the Dennis Addition, as they did not extend through the undivided western blocks which formed a barrier between Polk Street, on the south, and Eleventh Street on the north. Eventually, as the western blocks were subdivided, streets were cut through to align with Phoenix city streets. As the various subdivisions were platted, all of blocks 1, 4, 5, 8, and the northern portions of blocks 6 and 9, were cut into long, narrow building lots, most of which measured between 40' and 50' in width and 137.5' in length. Much of the western section of the Dennis Addition remained intact with individual lots only in Block 1 and the northernmost lots of Block 6, which fronted onto the streetcar line along Pierce Street. In all, the Dennis Addition and its subdivisions contained 393 individual building lots. Mount Pleasant was the largest, with 180 lots fronting onto the east-west, Polk, Taylor, Fillmore, and Pierce streets. The Highland subdivision had 100 lots fronting onto Pierce, McKinley, Garfield, and Roosevelt Streets. The Sunnyside Tract contained only 42 lots, two-thirds of which fronted on both side of Garfield and the remainder on Roosevelt Streets. All but eight of the 393 lots were surveyed with the narrow ends fronting onto the east-west running streets throughout the Dennis Addition and its subdivisions. The eight remaining lots fronted onto north-south streets; four lots faced 9th Street, and four faced 7th Street. The layout served several purposes for developers. Houses facing east-west streets were spared the full brunt of the Arizona sun, a fact that must have been a selling point to potential buyers. Also, the narrow lot layout allowed greater access to the streetcar line for more residents. Despite the initial slow pace of growth, the streetcar extension provided good access to both the Dennis and Brill additions and ultimately helped spur development in the tracts. Between 1900 and 1911, numerous pyramidal cottages were built in the neighborhood, many of them along the streetcar line on Pierce Street. By 1910, eighteen such houses were completed on Pierce Street between 7th and 9th streets (See Continuation Sheet pg. 73, 1911 Sanborn Map). The cottages are distinguished by their compact size and pyramidal-shaped roofs. Typically they follow a bungalow plan with two in-tandem rows of rooms arranged in a rectangular footprint with an inset porch. Most of those found in the Garfield Historic District are constructed of brick, though molded concrete block and frame examples exist. Early versions feature Classical order columns while later ones adopt the tapered posts of Craftsman influenced bungalows. Such houses were once common in Phoenix but they are quickly disappearing from the landscape. The Garfield Historic District has the largest concentration of early 20th century pyramidal cottages in the city. Early 20th century development in the neighborhood remained on or near the streetcar line and in the blocks closest to the city core. By 1910, a number of houses were built in the western blocks of Van Buren and E. Polk and Dennis streets, close to the original townsite boundaries. The growing success of the Dennis Addition and its smaller subdivisions prompted several adjacent landowners to pursue similar projects. The largest of these was Germania Place (See Continuation Sheet pg. 68, Germania Place), which was platted by the German Investment Corporation in 1909. The corporation was represented by Jacob Hirschy, H. J. Latham, and Mary Culver. Hirschy, a native of Indiana, served as president of the corporation. Latham was the official secretary. The subdivision lay immediately east of the Dennis Addition and extended from 12th Street on the west, to 16th Street on the east, and from Van Buren on the south, to Roosevelt Street on the north. Unlike the junior subdivisions in the Dennis Addition, the original layout and configuration of lots and blocks in Germania Place was irregular, due in part to the presence of the Salt River Valley Canal, which ran at a slight angle east to west through the subdivision and separated the southern third from the northern portion. The northern portion was divided into fifteen blocks, most of which measured approximately 340' by 530'. They were not further divided into lots, indicating that they were not ready for immediate development. Three of the blocks bordered the canal and were of irregular size. Only one street, Fillmore, penetrated into the northern portion but it did not extend through the addition. The southern section was divided into eastern and western portions. The western portion of the plat was blank but the eastern portion was subdivided into lots and blocks. Comprising most of the southeastern quarter of the plat, this section was the only part of the addition with lots on streets. Most lots fronted onto the east-west streets of Van Buren and Polk, but four faced the north-south 14th Street. All lots were narrow and deep, with the narrow side fronting the streets. They varied widely in size; most lots were 100' wide but they ranged from 200'-512' in depth (Germania Place, February 15, 1909). Because it lay further from the streetcar lines, between 12th and 16th streets, Germania Place did not see immediate development. However, the timing of the subdivision in 1909 was fortuitous, as the Roosevelt Dam was completed just a few years later, in 1911; the achievement ensured substantial agricultural growth and attracted thousands of new residents to Phoenix. At the same time, the rising use of automobiles allowed families to live further from the streetcar lines. As a result, development spread into Germania Place and the addition evolved as a continuation of the Dennis Addition and its smaller subdivisions. The earliest development in the neighborhood corresponds to the completion of Roosevelt Dam in 1911 and is similar to that which occurred in the Dennis Addition at the same time. Later development in Germania Place reflects Phoenix's continued growth in the early 20th century and the rise of automobile use for basic transportation. Some industrial development also occurred in the southwestern part of the addition. Valley Flour Mills lay at the southwest corner of Van Buren and 9th streets, and the new city water works occupied the southeast corner of Dennis and 9th streets. Such uses were not atypical in the years before zoning laws. The water works, in particular, has been a permanent fixture in the history of the Garfield Historic District. In 1889, the Phoenix Water Works Company, a private operation, drilled several water wells outside the city boundaries near the intersection of present 9th and Van Buren streets (Phoenix Water Services). The 1893 Sanborn Fire Insurance Co. map clearly shows the city water works on that site (See Continuation Sheet pg. 69, City Water Works, 1893). In 1907, the city purchased the private water works for $150,000 and assumed operation of the system. By 1911, the location contained the pump house and a new repair shop, a 50 foot well, a standpipe, and several tool sheds and other auxiliary buildings. In addition, the old street railway power house which was no longer in use at that time, lay just behind the pump house to the east. In 1913, the city began to investigate the possibility of obtaining water from the Verde River and in 1920, work commenced on the 28-mile Verde pipeline which began supplying water to the city in 1922. The pipeline terminated at the city water works at present Verde Park (See Continuation Sheet pg. 70, Verde Park 1949). By 1949, the site contained a small pump house for an Alus Chambers deep well pump (Phoenix Water Services; Sanborn maps). The water works site served the Phoenix public in other ways, as well. As city property, it became one of seven small municipal parks scattered among the Phoenix neighborhoods. Little was done to improve the site until the 1930's when federal money was made available to the city for parks development through the Public Works Administration (PWA). Although Phoenix did not use grant money for its existing parks, the funding helped jump-start the city's park development and a small recreation center was built on the grounds of Verde Park. The park is named for the Verde River and is part of the Garfield Historic District. The city property also became home to "C Shift" of the fire department in 1947. Firemen were enlisted to repair small equipment for the Parks Department on the site. A small building with firemen's quarters was built in 1949 and another structure was completed in 1952. Today, the park contains recreation facilities and a small building that dates from the Verde River project, as well as two buildings that served as Fire Station No. 2, built in 1949 and 1952. The neighborhood that grew up around the historic water works and park was largely residential in nature. Occupants in the new neighborhood included ranchers and farmers whose land probably lay just beyond the eastern or northern boundaries of the district. Mechanics and laborers, some of whom worked at the mill, the city water works, or at other nearby industrial plants, lived in the neighborhood. Various building contractors lived in the district, including G. W. Holt, a carpenter, who occupied the ca. 1910 house at 1008 E. Fillmore Street in 1918, and Bert Davis, a plasterer, who lived in the ca. 1915 house at 1015 E. Fillmore Street, the same year. Also in 1918, boilermaker A. G. Lambert resided at the ca. 1910 house at 915 E. Taylor Street. A handful of residents, including O. H. Kerr, owned their own businesses. Kerr was the co-owner of the Kerr & Smalley Music Company and lived at 1302 E. Pierce Street, a house built ca. 1911. Development increased in the district after 1911 when the Roosevelt Dam was completed. The dam enhanced the Valley's agricultural potential, and its completion sparked a population boom that spurred demand for close-in housing throughout the Phoenix area. As a result, significant activity took place in the Dennis Addition between 1911 and 1915 as scores of bungalows filled the streets. Pierce Street remained a popular address on the streetcar line but McKinley Street, one block to the north, and Fillmore and Taylor Streets, one and two blocks to the south, respectively, also saw significant development. The Valley Realty and Construction Company may have foreseen the impact of Roosevelt Dam on the Phoenix area's population and growth. In 1911, the company bought lots 2 and 9 of the original Dennis Addition and filed a new plat for their Victoria Place (NR 1989) (See Continuation Sheet pg. 71, Victoria Place 1911). The company was one of the few entities to build more than a couple of houses in the Dennis Addition during the early years. It subdivided the narrow tract in the 700 block of McKinley Street and filled the lots with ready-made California bungalows. The houses sold before and after World War I. By 1918, numerous occupations were represented in the district. They ranged from educators and ministers, to retail salesmen and construction workers. The following residents indicate the variety of occupations in the district as shown in the 1918 city directory. Professionals included R. T. Cook, the principal of Phoenix Union High School in 1918, lived at 902 E. Taylor Street, a house built about 1915. L. B. Ragsdale, the principal of the Seventh Day Adventist School in the neighborhood, lived at 1117 E. Fillmore Street, which was also built about 1915. Minister E. D. Raley lived in the ca. 1915 duplex at 1417-1419 E. Garfield Street in 1918. L. L. Dominguez, whose family lived in the ca. 1918 house at 927 N. 8th Street through the 1960's, was a clerk at Popular Dry Goods. Clerk Russell Linebarger, lived at 917 E. Garfield Street, a house built ca. 1912. Rancher R. H. Fields occupied the ca. 1914 house at 730 E. McKinley Street and candymaker J. J. Kennedy, lived in the ca. 1912 house at 1435 E. McKinley Street. J. B. Walters, a fieldman for a creamery, lived at a house built about 1916 at 1138 E. Polk Street. Bert Davis, a plasterer (1015 E. Fillmore Street, built ca. 1915), and C. O. Townsend, an engineer (1403 E. Fillmore Street, built ca. 1915), were among the districts contractors. Rapid development in the years following the construction of the dam and through the 1920's resulted in relatively cohesive streetscapes of similarly sized houses that shared common plan types, architectural styles, set backs and materials. The nationwide enchantment with bungalows during that period greatly influenced construction in the district which filled with Craftsman and California bungalows. Most are one-story, compact houses with wide roof overhangs, gabled roofs and full or partial width front porches. Craftsman bungalows typically exhibit some structural members such as exposed rafter ends, knee braces, and tapered porch posts. 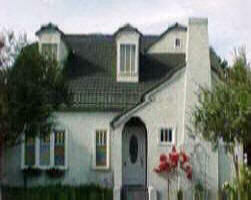 California bungalows are similar in form and plan but tend to possess less ornamentation. The western portion of the Garfield Historic District developed first, due to its proximity to the streetcar line and city services. By the 1920's, however, developers turned to the eastern portion of the tract. As automobiles gained favor, residents were no longer tied to the streetcar for transportation. At the same time, the subdivision patterns were changing in the undeveloped portion of the district. Whereas earlier developments were typically small, sometimes only encompassing a few houses, larger scale development began to take place in the district in the mid-1920's, particularly in the sparsely settled eastern half of the district. Fred C. Henshaw exemplifies the trend toward larger developments in the eastern portion of the Garfield Historic District. In 1925, he filed the Garfield Place Subdivision, which includes the 1400-1600 blocks of Roosevelt (south side), Garfield, McKinley, Pierce and Fillmore streets. The physical effect of such large scale development is easily seen in streetscapes filled with nearly identical California bungalows. They appear to have been built by the same builder or from kits such as those available through national vendors like Pacific Ready-Cut Homes or Ye Planry (See Continuation Sheet pg. 72, Ye Planry House Plan 1918). Some may have been built as speculative ventures. New construction in the 1910's and 1920's far outnumbered the original housing stock and imposed its own patterns on the neighborhood. Earlier houses in the district varied greatly in their size, scale, setback and style, and appeared to be anomalies rather than models for the bungalow era. As the pace of construction quickened during the 1910s and through the 1920's, one-story brick or frame bungalows with side, front, or cross-gabled roofs came to dominate the streetscapes. Set squarely on their lots with a uniform setback and similar size, porch configuration, building materials and stylistic embellishment, these bungalows collectively established a rhythm, tone, and density followed by later infill development. An overview of neighborhood occupations shows that the Garfield Historic District was largely occupied by middle- and working-class families. Exceptions include R. W. Kramer, an attorney who lived in a large Craftsman house at 705 N. 7th Street (built ca. 1920), and J. W. Spear, editor of the Arizona Republican, at 916 (aka 910) E. McKinley Street. More typically, though, were the many clerks, building contractors, mechanics, and salesmen who lived in the neighborhood. Most lived with their families although some single people resided in the community, often living in duplexes or rear dwellings. Although the district was almost entirely residential in character, it attracted a number of neighborhood institutions and small commercial businesses. Three of the four extant churches in the district were built between 1925 and 1928 and an addition to the 1913 Garfield Public School was built in 1925. Such investment in the neighborhood indicated its size and stability. And, while small retail enterprises existed in the area as early as 1915, a variety of stores including a drug store, several groceries, and gas stations were located in the district by the 1920's. Most were clustered at the streetcar stops at Pierce and 10th Streets and at 10th and Roosevelt streets. Others appeared at the periphery of the district, on 7th Street, 16th Street, and Van Buren Street, which became a U.S. highway. By 1929, single-family dwellings and duplexes, most of which were bungalows of some type, could be found throughout the neighborhood. Henshaw's development in the eastern half of the district consisted largely of Craftsman or California bungalows and Period Revival style houses based on a bungalow floor plan. His project reinforced the patterns set by earlier bungalow development and served as a model for later development in the 1930's, 1940's, and early 1950's. As a consequence, streetscapes are fairly uniform in rhythm, scale, and set back throughout the Garfield Historic District. While the Great Depression stymied many new development projects throughout Phoenix during the 1930's, the Garfield Historic District was already a mature neighborhood with approximately 85% of the present housing stock intact by 1935. On the remaining vacant lots, builders began to move away from the familiar bungalow plans and build in the modern styles. By the end of the 1930's, early Ranch style houses with low pitched roofs and steel casement windows began to appear as infill housing in the neighborhood. After World War II, builders resumed construction of Early/Transitional Ranch Style houses; some were built on the few undeveloped lots in the neighborhood but others replaced some of the oldest houses in the district. Most are brick or concrete block Ranch houses with hipped roofs, clay tile ridgelines, and steel casement windows. By 1955, the neighborhood was largely filled with houses and neighborhood stores and services. Most of the decade passed with little or no new construction other than remodeling. By the 1960's, some multi-family apartment complexes appeared in the district. While some replaced the original houses on the lots, others merely occupied lots that had remained vacant for decades. More recently, historic homes have been torn down and replaced with numerous new "bungalows". Many are side-gabled stucco houses with shed-roofed "eyebrow" dormers. They are similar in size, scale, massing, and setback to the many Craftsman and Classical Revival bungalows throughout the district. This trend continues to the present. In keeping with the agricultural origins of the addition, only a handful of properties from the late 19th century survive in the district. Some farmhouses and associated resources may have pre-dated the Dennis Addition (1883), but the oldest extant dwelling in the district is the 1893 Burgess Hadsell House at 1001 E. Fillmore (NR 1989). A mass vernacular brick dwelling with few architectural references beyond a wraparound porch and segmental arched windows, it represents the earliest type of residential architecture in Phoenix. Other late 19th century houses in the district followed the builder's tradition in which small and moderate-sized houses were assembled by local builders, often carpenters, following standardized plans published in pattern books. Several late 19th century houses in the district, including the hipped roof cottage at 1138 E. Taylor Street, reflect this trend. Popular 20th century architectural forms and styles abound in the Garfield Historic District largely because the addition was carved into many small parcels with numerous builders working on individual projects. Among the more popular plan types in the addition from 1900-1911 was the pyramidal cottage. Built in an era before widespread automobile usage, these houses are found primarily in the western half of the district on or near the old streetcar line. Most of those found in the Garfield District are square-shaped brick houses with pyramidal roofs and half-façade inset porches. Early examples have Classical references such as round or square Doric columns and boxed cornices; later ones adopted Craftsman motifs including exposed rafter ends and tapered porch posts. A good example of a pyramidal cottage with Classical influences including a round Doric porch column can be found at 1205 E. Pierce Street. Despite the streetcar line through the Dennis Addition, the neighborhood experienced only modest growth in its formative years. An architectural survey conducted in 1994 found only 49 buildings in the combined Garfield and North Garfield districts built in the nearly three decades between 1883, when the Dennis Addition was platted, and 1911, when Roosevelt Dam was completed. This number constitutes only about 5% of the district's present building fabric, compared with approximately 500 houses built during the phenomenal building boom of the 1910's and 1920's. This growth spurt accounts for about 66% of the district's present building stock. Most of the houses built during the boom years (1912-1929) followed a bungalow plan: they had rectangular footprints with two adjacent rows of in-tandem rooms. One row contained the private spaces (two or three bedrooms separated by a bathroom), and the other row held the public spaces (living room, dining room, and kitchen). The bungalow craze, as it was called, swept the country and became the most popular house form for middle and working class families throughout the nation. The bungalow's national popularity coincided with the Phoenix building boom and it was replicated throughout the Garfield Historic District which has many fine examples. 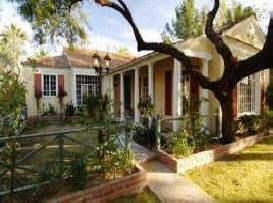 Early bungalows featured Classical treatments such as full-façade porches supported by Classical order columns. Ultimately, though, Craftsman influenced bungalows highlighting structural elements came to dominate the district with exposed rafter ends, knee braces, and partial façade porches with tapered wood posts on brick piers. Starting in the 1920's, the California Bungalow appeared in the neighborhood, especially in the eastern, previously undeveloped portion. The California bungalow generally features less ornamentation than the Craftsman bungalow. Despite bungalow hegemony in the Garfield Historic District, other styles gained favor with the house-buying public and Period Revival styles began to crop up in the neighborhood during the 1920s. Foremost among them was the Spanish Colonial Revival style which was particularly popular in California and the Southwest for its romantic architectural references to Spanish heritage such as arched entries, use of stucco, and red clay tile roofs and porches. Toward the end of the 1920s, Tudor and English Cottage styles appeared in eastern streets in the district, particularly on Garfield and McKinley streets. Over the course of its residential development, a number of stores arose to serve the neighborhood. Most are 1-part brick commercial buildings with awnings. The oldest appears to date to the turn of the 20th century and has segmental arch windows and a wraparound porch supported by decorative posts reminiscent of the Victorian period. Such stores generally sold staple items, some produce, and dry goods. Later stores in the district date to the 1920's and 1930's and offered greater selection. They feature glass storefronts and metal canopies held by iron tie rods. Increased automobile use opened the neighborhood to a greater customer base and these later enterprises served both the immediate neighborhood and the larger community. The J. B. Bayless Store No. 7 (NR 1985), at 825 N. 7th Street is an excellent example of this type of store in the Garfield Historic District. Built on a busy commuter route in 1928, the store featured five departments and advertised 'ample automobile parking' in front of the store. Another example is Brown's Pharmacy (NR 1985), built in 1927 at 1002 E. Pierce Street. Located at the principal streetcar stop in the Garfield neighborhood, the corner of Pierce and 10th streets, the business likely catered to residents in surrounding neighborhoods in addition to the local clientele. Although the neighborhood was largely completed by the 1930's, builders continued to develop the remaining vacant lots with modern houses. By the end of the 1930's, early Ranch style houses with low pitched roofs and steel casement windows began to appear as infill housing in the neighborhood. After World War II, builders resumed construction of Early/Transitional Ranch Style houses; some were built on the few undeveloped lots in the neighborhood but others replaced some of the oldest houses in the district. A relatively long period through the 1950's passed with little or no new construction in the Garfield Historic District. 1950's. By the 1960's, some older houses were demolished for some multi-family apartment complexes. More recently, older homes have been demolished and replaced with new bungalow's. Most are side-gabled stucco houses with shed-roofed eyebrow dormers. While they are noncontributing elements of the district, they are similar in size, scale, massing, and setback to the many Craftsman and Classical Revival bungalows throughout the district. Due to the district's age, houses in the Garfield Historic District displays a variety of residential styles that represent a wide range of architectural designs that gained popularity over an approximately 60-year period of time. Among the earliest houses are a handful of Vernacular farmhouses. In the early 20th century, Classical Revival houses with overarching hipped roofs and deep porches supported by classical order columns were built. In the 1910's, 1920's, and into the 1930's, Craftsman bungalows held sway and many are represented in the district. 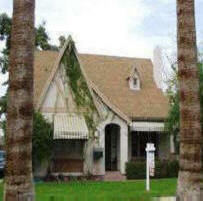 Because the neighborhood was largely built out by the 1930's, it has only a handful of Period Revival styles. Tudor and Spanish Colonial Revival or Southwest styles are the most common in this district. The postwar period saw a number of early and transitional Ranch Style houses as well as some modest Minimal Traditional cottages. Early/Transitional Ranch style houses are more common and feature brick or concrete block with hipped roofs, clay tile ridgelines, and steel casement windows.